This bike parking lift has a unique design. It’s a space saving solution that is simple and smart. The bike lift is mechanical but it doesn’t require a ton of physical strength. Once the wheels are placed inside the lift, the lift will magically raise your bike while you direct it upward. It’s an ideal bike rack that saves space and tidies up your living space or work area. Use it in your home, office, garage, balcony or under any shelter. Simple to install. 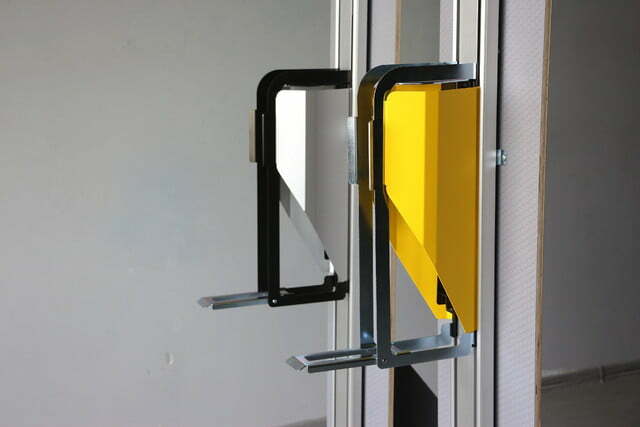 Can be installed in areas that are uneven or with a complicated surface area. For those who are young, old, or have difficulty lifting a heavy bike, this bike parking lift is definitely for you. Most upright bike racks require lifting the bike up to the rack. However, this bike parking lift catches the wheels and helps direct it upwards. It takes pressure off ones back and neck. Now there is no excuse not to put your bike back in its proper place after a bike ride. What did you think of this invention? Please leave your comments below. Sign up to our daily newsletter so you will never miss a new giveaway or invention.